Seattle-based architecture firm, Signal Architecture + Research, recently completed Cottonwood Canyon Experience Center—a new multi-use facility in Central Oregon’s Cottonwood Canyon State Park that offers a unique recreation experience that aligns with the scale of the landscape. 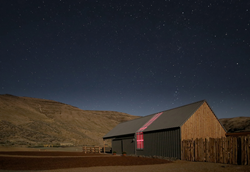 Cottonwood Canyon Experience Center under the starry skies of eastern Oregon. Photo provided by Oregon Parks and Recreation Department. Last month Seattle-based architecture firm, Signal Architecture + Research celebrated the opening of Cottonwood Canyon Experience Center in Central Oregon’s Cottonwood Canyon State Park. Cottonwood Canyon State Park, established in 2013, is Oregon’s second largest state park with over 8,000 acres on the lower John Day River. Prior to the Park’s founding, the land was privately owned for decades with limited public access. The park was established as a monument to the outdoor experience and as a gateway to the natural habitats and wildlife that can only be found in this unexplored area of Oregon. Unlike Oregon’s other parks that act as entry points to beaches or public waterways, Cottonwood Canyon State Park is a destination. It’s the only park in Oregon with an unprecedented amount of wildlife and unrestricted access to the John Day River. Experience Center. The statewide nonprofit, Oregon State Parks Foundation, helped raise the funds to build the Experience Center. The rugged and fragile landscape, rich in both history and texture, required a structure that complemented its surroundings. Signal Architecture + Research, was selected to design the Experience Center for their site-specific project approach that prioritizes the story of the place and the language of the landscape. symbolic reminder of agrarian industry past and present. The Experience Center is inspired by the resourcefulness and rugged character of the central Oregon ranch landscape and privately-owned Murtha Cow Camp that occupied the site for decades. Honest materials, durability, and weather protection informed the placement of the building to create a multipurpose facility that frames the past and the future in a timeless venue. Interior spaces are configured to allow for maximum adaptability. A ‘heavy wall’ allows for storage of programing carts, exhibits, library media, and environmental education tools while a weather protected, open side of the building lets indoor activities spill out to the meadow and beyond. The building is placed on the site so outdoor gathering spaces are shielded from heavy winds, afternoon sun, and weather to make the space more conducive to outdoor education. Shaded outdoor area allows the building to double in size, providing outdoor workspace for summer institutes and research programing focused on Cottonwood Canyon and the John Day River. Approaching the building at night, visitors will notice a unique ribbon of light emanating from the building. While the form is like barns of the region, with a slight modern twist, the light signals that this place is different, and inspiration is happening there. Similar to the resourcefulness of historic farm communities and ranches, the building takes its sustainability cues from a blend of site specific, low-tech opportunities and current technology to save energy and stand the test of time. To shelter from prevailing winds, large doors are concentrated on the leeward side of the structure, with a Juniper shade arbor to protect against direct sun. Juniper is a sustainable forest product that was sourced locally to support regional ecosystems and the economy. Opposing doors allow for cross ventilation and translucent roofing welcomes daylight, reducing daytime lighting demands. Durable exterior materials and a wood interior do not require repainting and age well, looking better with time. “Cottonwood Canyon Experience Center is a capstone in the new State Park. Signal worked with us to design a facility that is both familiar to locals and inspiring to visitors and is at home in the rugged and beautiful landscape,” says Scott Nebeker, Oregon State Parks Development Manager. The Experience Center provides an opportunity for outdoor learning, environmental education, regional activities, and cultural events that serve the community, the region, and visitors. The multi-use facility includes classroom space, interpretive displays, activity and meeting areas, park-specific library, and gathering space for events. 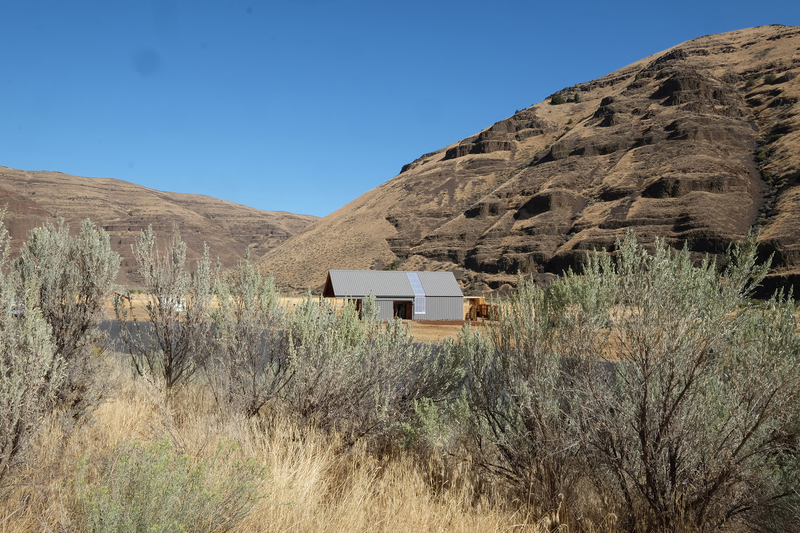 Cottonwood Canyon Experience Center will serve Oregon State Parks as a capstone gathering place amongst the rich scenic landscape of Central Oregon, connecting stories of history with programming and learning experiences for future generations. Focused on connecting people with place, Signal Architecture + Research PLLC works to design inspiring places for humankind, drawing distinct influence of experience through materials, function, light, nature, and sound. Communication, listening, and collaboration – from clients to communities creates the foundation for our approach to integrative design dialog. Cottonwood Canyon Experience Center is a multi-use facility that serves the John Day River valley in eastern Oregon. Photo provided by Signal Architecture + Research.Cottonwood Canyon Experience Center is a multi-use facility that serves the John Day River valley in eastern Oregon. Photo provided by Signal Architecture + Research. Cottonwood Canyon Experience Center is the heart of the new development in Cottonwood State Park. Photo provided by Oregon Parks and Recreation Department.Cottonwood Canyon Experience Center is the heart of the new development in Cottonwood State Park. Photo provided by Oregon Parks and Recreation Department.